I should learn by now to expect the unexpected when Mike or I change a plan at the last minute on a “hunch,” like tonight. The PLAN was to cook the chicken that has been thawing and roast the veggies from the fridge that need to be eaten. Out of the blue, Mike asked, “Are you up for a change of plans? I have a hankering for Mellow Mushroom.” So a hankering disguised his hunch and we headed to the minivan to commute into Winston for some yummy, gooey delicious pizza. After dinner, Sadie, in her purple, tapping dress-up clickety-clack shoes, asked consistently, “Can we pleeeeeeeease stop at the park and walk around on the stage?” We always park right next to a small arts center with an outdoor amphitheater. It has a fountain and a climbing stairwell, and the kids always run up and around as quickly as they can, run back down the other side, and perform something for us from the fountain stage. Tonight, their giggles and grins on the up-run were halted abruptly and JM called down calmly, “Mom? Will you please come up here? There is something very scary that you need to see.” He wouldn’t allow his little sister to come near where he was standing, but had her stay back and take a seat on a step. Mabyn and I rushed up to him where I thought I would find a dead frog, snake, or rodent. 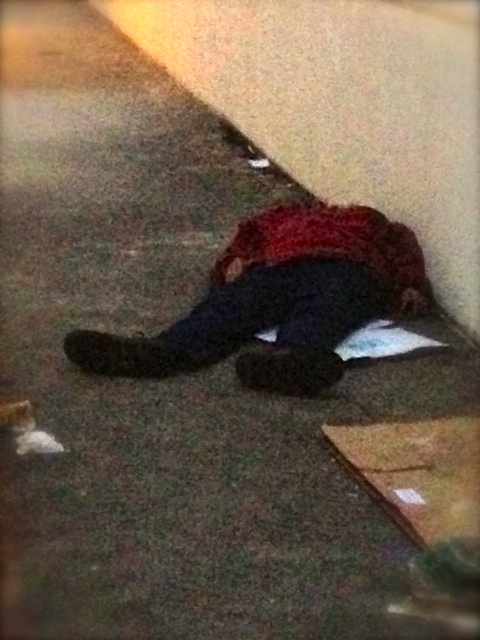 Instead we found a man, perhaps in his 60s; we couldn’t tell if he was sleeping, passed out, or dead. 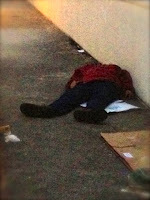 Whatever he was, he was unresponsive, so I called for Mike to run up and take a closer look. The man in the red coat appeared to be breathing, but we could not wake him, so we called for the rescuers to come. You see, I can’t take a situation like this lightly. My grandfather was thought to be drunk, but in actuality was having a stroke at the side of a road when he was taken to jail instead of the hospital. It marked the beginning of the end of his final days. Those hours in jail had made a monumental difference. Therefore, we called 911 and we waited. I had NO IDEA that they would send a fire truck…. followed by an ambulance…. followed by a patrol car. Sirens and alarms flooded the air, and the man did not budge, not even under the canopy of clamor that filled the darkening sky. In front of me was the scary view of the man in the red coat. To my left was the peaceful, serene view of the fountain stage and my lovely, lively children, patiently waiting with care and concern below. I walked down to speak to the now parked rescue attendants. We watched them do their job, and very quickly, they had the man in the red coat on the stretcher, in the ambulance, and on the way to the hospital. He was alive, and my children were grateful that he would be in a warm bed tonight with a meal or two before he has to find his way again tomorrow. Our conversations back to the silver minivan were strong, and as we felt the cold air thin out and the raindrops begin, we “answered” many unanswerable questions along the ride home. “One Life” is still our yearly theme. While I know nothing of the man in the red coat, he looked very much like my own father, who looks very much like his. “One Life—living life where every ONE matters.” This means that every ONE matters. In case that wasn’t clear enough, I’ll say it ONE more time—every ONE matters. And not just every one person, but every one choice, every one word, every one decision, every one action, every one reaction, and every one more. Every One of Every… EVERYTHING. If you and I lived our lives for the ONE, then things would be different. And like those three siren-sounding vehicles, we’d be surrounding those in need; we’d be the rescuers. This blog post has no pretty bow on it. It’s an open-ended story within an open-ended conversation. I’m glad that our children are openly learning life; they are learning to put commas where so many life stories seem to have been closed off with a period. Any time we want to stamp “The End (period),” we must believe that there is more to the story.